Deus Ex: Mankind Divided Game Director Jean-François Dugas said in April that the entire game, including the bosses, will be "ghostable." But in a more recent interview with Eurogamer, Gameplay Director Patrick Fortier clarified that while players won't necessarily have to kill the bosses they meet, they will have to fight them. The concern about Mankind Divided's boss encounters stems from its predecessor, Deus Ex: Human Revolution, which allowed (and even encouraged) non-combat augmentations—hacking, stealth, social—and then threw players into boss fights in which those augs were entirely useless. Speaking from personal experience, I can tell you that It was not fun. That's why it was so pleasing to hear Dugas assure everyone that the same mistake won't be made in Mankind Divided. But Fortier said that the new game will in fact contain "classic boss fights" that players won't be able to dodge. "There are verbal debates with certain NPCs, [and] classic boss fights are another thing. They're two separate things," he explained. "Having said that, in a classic boss fight we will support combat, stealth, lethal, non-lethal, in ways we didn't necessarily manage in Human Revolution." While he wouldn't offer any specific examples, he said that events and actions leading up to an encounter with a boss could influence how it unfolds, or how the player is equipped to handle it. 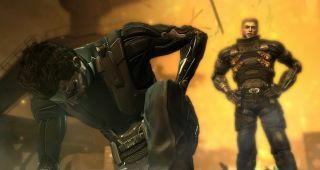 It will be possible to deal with bosses in non-lethal ways, and Eidos Montreal is also working to ensure that boss fights are a "logical" fit in the game world, and that "no matter who you are, a bullet to the head is a bullet to the head." But one way or another, they will have to be overcome. "In the classical sense of the boss fight, it's not a debate, it's not an opportunity to have the same mechanic, the debate mechanic that we have using your CASIE [Computer Assisted Social Interaction Enhancer] augmentation to read the body language and the heartbeat and all of that—that's not happening in a classic boss fight," Fortier said. "Having said that, if you've equipped yourself in a particular way then maybe specific solutions are offered to you and that will result in some dialogue of some sort, but it's not debate gameplay." The full interview goes into considerable depth and is definitely worth a few minutes of your time if you want an idea of what's coming. But the bottom line is that you won't be able to avoid every boss fight, but you will be better equipped to handle them, even if you've focused on non-combat augs. It's too bad in a way—I think a Fortress of Regrets-style chit-chat with The Bull would make for a very interesting bit of play—but I'll take it.